In our search for a great Thai BYOB restaurant, we found Nicky’s Thai Kitchen was a great fit. The restaurant is small, seating just under 40 people, so the managers agreed to close the restaurant to our group. Despite a sellout RSVP list, mother nature prevented several from attendance. 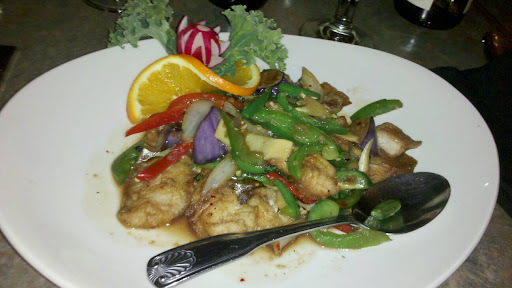 The meal featured some traditional Thai options and some Nicky’s specialties. Being that we are fans of Thai, but not connoissuers, we had a close friend help choose the menu options. Some of which included appetizers of fresh spring rolls and thai toasts; and entrées of Fish Basil, Chicken Pad Thai and Pork Spicy Noodles. The meal was great and well received by the group. This month we exchanged wines using love songs. Upon placing a bottle of wine on the exchange table, each person drew a random love song title and artist from a wine glass. The order of wine selection was determined by the order the song was released, oldest to newest. The list ranged from Elvis to Aerosmith and most found the exchange to be a creative tie-in to Valentine’s Day. Thank you to Nicky’s for hosting our group. We look forward to returning in the future.